Come ring in The Year of the Rooster Japanese style in Downtown Brooklyn! The sound of shamisen and traditional folk dances will shake your body+soul awake and our mouth-watering selection of Japanese fried chicken, savory soups, rice balls, donburi and gourmet Japanese treats will nourish you inside out! Family crafts, try-your-own calligraphy and New Year’s games will be available for all. The Roulette bar will be open for those 21+ looking to add a little buzz to their afternoon. The Program includes Shamisen player Sumie Kaneko, Live Giant Calligraphy by Taisan Tanaka and Traditional Japanese New Year’s Dance including the Shishimai dance (the Lion Dance) by Minbuza aka Japanese Folk Dance Institute of New York. The Festival is hosted by actors Saori Goda and Craig A. Grant. A silent auction benefiting BNG aka Brooklyn Nihongo Gakuen (Brooklyn Japanese School) will be held on the 2nd floor, with a selection of Japanese designer purses and bags. One entry ticket gets you all the shows, mochi-pounding, arts+crafts activities. Come celebrate with us! – Limited Stroller and Coat Check available (self check). Venue is not responsible for lost items. No parking lot but street parking is available. – Admission will be limited this year to avoid any large crowds. Make sure to get advance tickets. This time, we will have Koji Nishiyama, Masaya Okubo, and Yoshi Amao. Enjoy the samurai world! 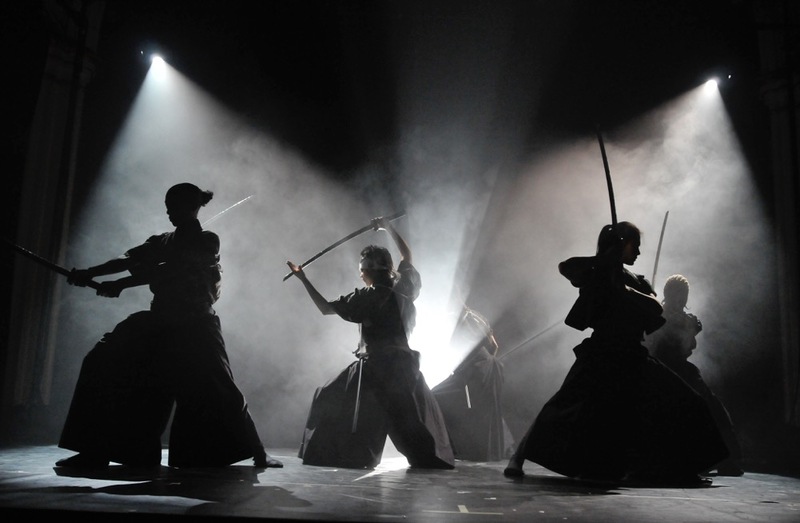 Through the medium of Japanese folk dance, MINBUZA aka Japanese Folk Dance Institute of New York introduces audiences to the culture and history of Japan and the spirit of the Japanese people! Enjoy the New Year Japanese traditional dances, Shishimai – Lion Dance and more! A kendama is a Japanese toy that requires careful skill and quick reflexes. It’s popularity has exploded around the world. See the kendama skillfully honed and learn the amazing battle style Kendama at the Kendama booth by KeNYC. There will be plenty of activities for everyone, including traditional New Years games, Japanese calligraphy, Origami, etc. Happy New Years! Shishimai (the Lion Dance) brings you good health and happiness! Shishimai is an expression of Japanese traditional culture. This year, Shishimai (performed by the Japanese Folk Dance Institute of New York – Minbuza) is coming back to the Brooklyn Japanese New Year Festival! What is the Lion Dance? The Lion Dance is often seen during New Year’s events, as it is said to bring good fortune for the entire year. According to tradition, the Shishi (lion protector) “eats” the misfortunes of the people. It pretends to bite their heads, consuming their troubles, thus allowing us to enjoy good health and happiness throughout the year. Japanese New Year Arts & Crafts. Experience tasty Japanese food from Cafe Zaiya. Japan is not only known for their sushi, but have some of the best bakers creating the exquisite bread. Enjoy fresh the hand-made menu, such as Onigiri (Rice ball), Seafood Miso Soup, Japanese Bento-box, Japanese sweet buns & savories, sweet red-bean soup and more! Mmmmmm good! One of the TOP VENDORS at SMORGASBORD, ONI SAUCE will be selling delicious home-style Japanese classics like KARAAGE (Japanese fried chicken), and many types of Donburi (meat or fish over rice. Veggie option available as well). Their famous Onion Sauce and incredible Rayu Sauce (a deeply flavorful hot chili based condiment) will be available for purchase at the booth as well.